After a long day spent exploring Singapore , we welcome you home to comforts of Bayview Hotel Found in Marina Bay of Singapore,Bayview Hotel is ideal for business travelers. LocationThis hotel sits directly next to Singapore Art Museum & Singapore History Museum . Next to restaurants,Bayview Hotel offers guests the perfect location. 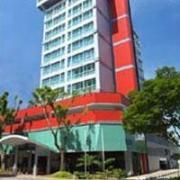 The Bayview Hotel offers guests the convenience of being just 1 mile from Raffles City, Marina Square.